short haircut an old woman sniffs flowers, smiles and enjoys. Gray-haired grandmother with a bouquet of irises in his hands.Green foliage tree in the background. hd00:05short haircut an old woman sniffs flowers, smiles and enjoys. Gray-haired grandmother with a bouquet of irises in his hands.Green foliage tree in the background. hd00:09short haircut an old woman sniffs flowers, smiles and enjoys. 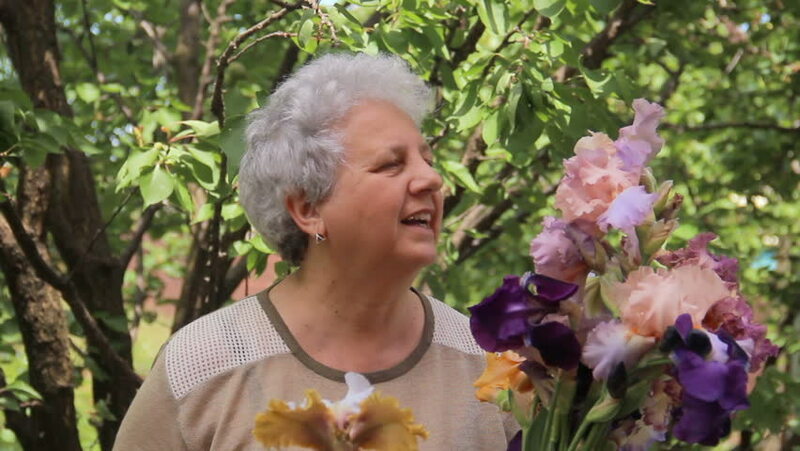 Gray-haired grandmother with a bouquet of irises in his hands.Green foliage tree in the background. hd00:07portrait of a short haircut an old woman sniffs flowers, smells flavor, smiles and enjoys. Gray-haired grandmother with a bouquet of irises in his hands. Green foliage tree in the background. hd00:14portrait of a short haircut an old woman sniffs flowers, smells flavor, smiles and enjoys. Gray-haired grandmother with a bouquet of irises in his hands. Green foliage tree in the background.